A group of Egyptian protesters on Monday evening converged on the Libyan embassy in Cairo, where they took down and burned the embassy's Libyan flag and defaced the building's entrance. Dozens of protesters gathered outside the embassy Monday evening after Egypt's Coptic Youth Front called for a sit-in at the embassy – located in Cairo's upscale Zamalek district – to protest the killing on Sunday of 45-year-old Egyptian Coptic-Christian Ezzat Atallah. Atallah, who had been accused of 'proselytising' in the North African country, was killed in Libya after allegedly being subject to torture. Skirmishes broke out when protesters at the embassy erected an Egyptian flag in front of the building's entrance. 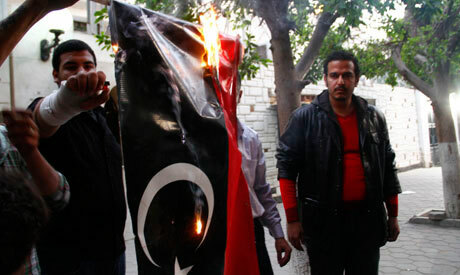 Libyan nationals inside the embassy tried to burn the Egyptian flag and responded by raising two more Libyan flags. Atallah's brother, who spoke to the media Sunday after receiving news of his brother's death, said his brother had been tortured after being moved from a Benghazi prison prior to investigations. Atallah had been among five Christian Egyptians detained in Libya for allegedly proselytising in the predominantly Muslim nation. A diplomat from the Egyptian Foreign Ministry confirmed on Monday morning Atallah's death, but attributed his death to natural causes, saying he had suffered from diabetes and heart ailments. The Coptic Youth Front has announced that it would start its sit-in in front of the embassy on Monday, citing demands that Atallah's family be appropriately compensated for his death and that others arrested on the same charges be released and returned back to Egypt.